How to remove the date from blogger post URL and make blogger permalink look like wordpress. Hello friends, Welcome to the latest tutorial. In this tutorial I will show you How to remove date from blogger post url along with .html? We all know that the default static link in Blogger can be a date other than WordPress. However, seeing the SEO point view, history is not a problem. In most of the URLs, we will not see this date on the Internet. In short, we do not like this default static link (with date in middle and .html at end of url) and most of us want to create a handsome link like WordPress. How the question arises that - How to remove date from blogger post url and How to remove .html form your blogger post url and make blogger permalink look like wordpress. First of all, let us 'Understanding Permalink in Blogger', Then I will tell you How to remove the date from blogger post URL and How to remove .html from blogger post URL? As we know that the default URL of blogger would look like this https://www.technicalswaroop.ooo/2018/10/how-to-remove-date-from-blogger-post-url.html and among this https://www.technicalswaroop.ooo/2018/10/ is the default link. 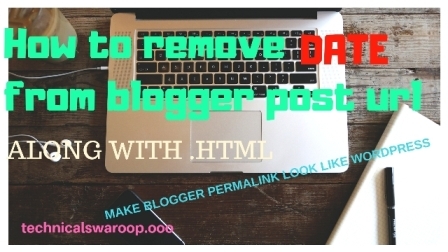 I will tell you how to make this BLOGGER permalink to this- https://www.technicalswaroop.ooo/how-to-remove-date-from-blogger-post-url/ , then it will be wonderful. It's not it. proof: TO give you prove, I have to remove the date from blogger post URL along with .html. Before you remove date from blogger post url along with .html, you must know that. This trick is only for new blogger who have just created there blog. If you are a old blogger, which is ranking in search engine, I will recommend you not to use this trick(if you want you can use, I am not forcing you not to use it). It is so because this could harm your ranking. Your old permalink which are rank on google will not work. You have to again index your new permalink and wait for many days. The link which you have share on Facebook, Twitter, Instagram,or Google Plus will not work. Which would ultimately decrease your traffic. When you will visit your post with old url, it will say 'url not found'. Removing date from a new blogger SITE, instead of decreasing your rank will increase your rank. If you have a new blog this as a very useful trick for you. This can give your blog WordPress look. Another important thing is that this type of permalink will rank very fast. You can get good traffic by using this trick. When you remove the date from blogger post URL then your URL will look professional. How to remove the date from blogger post URL? How to remove .html from blogger post URL? Now I thing you have understood How to remove the date from blogger post URL along with .html? If you have not understood How to remove the date from blogger post URL along with .html, you can comment bellow. If this code doesn't work or there is an error you can ask me. If you like this post please comment and tell me also tell me which trick you want next. Please share this post with your friends so that they can also remove the date from there blogger post. thank you, remember us and support us with your love! You have also learned how to remove year and month in blogger URL, how to remove dates from blogger permalink, permalink Blogspot without date, remove the date from blogger post URL, make blogger permalink format like WordPress. Excellent information, thank you for taking the time to share with us. Amazing insight you have on this.